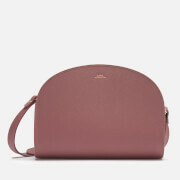 Women’s commuter laptop case from Marc Jacobs. Crafted from a lightweight, durable material, the bright pink briefcase fastens with a top zip and opens to reveal a roomy padded interior. Two top handles and an adjustable, removable cross body strap offer versatile wear, whilst a zip pocket to the rear provides storage for documents. Embossed branding throughout adds the finishing touch to the design. Dimensions: H: 25cm x W: 34cm x D: 3cm. Handle Drop: 8cm. Strap Drop: 39cm.